North Dakota ( /- dəˈkoʊtə/ ( listen)) is a U.S. state in the midwestern and northern regions of the United States. It is the nineteenth largest in area, the fourth smallest by population, and the fourth most sparsely populated of the 50 states. North Dakota was admitted to the Union on November 3, 1889, along with its neighboring state, South Dakota. Its capital is Bismarck, and its largest city is Fargo. State song(s): "North Dakota Hymn"
In the 21st century, North Dakota's natural resources have played a major role in its economic performance, particularly with the oil extraction from the Bakken formation, which lies beneath the northwestern part of the state. Such development has led to population growth and reduced unemployment. North Dakota is a Midwestern state of the United States. It borders Canada and lies at the center of the North American continent. The geographic center of North America is near the town of Rugby. Bismarck is the capital of North Dakota, and Fargo is the largest city. Soil is North Dakota's most precious resource. It is the base of the state's great agricultural wealth. But North Dakota also has enormous mineral resources. These mineral resources include billions of tons of lignite coal. In addition, North Dakota has large oil reserves. Petroleum was discovered in the state in 1951 and quickly became one of North Dakota's most valuable mineral resources. 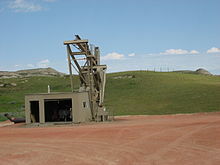 In the early 2000's, the emergence of hydraulic fracturing technologies enabled mining companies to extract huge amounts of oil from the Bakken shale rock formation in the western part of the state. North Dakota's economy is based more heavily on farming than are the economies of most other states. Many North Dakota factories process farm products or manufacture farm equipment. Many of the state’s merchants also rely on agriculture. Farms and ranches cover nearly all of North Dakota. They stretch from the flat Red River Valley in the east, across rolling plains, to the rugged Badlands in the west. The chief crop, wheat, is grown in nearly every county. North Dakota harvests more than 90 percent of the nation’s canola and flaxseed. It is also the country’s top producer of barley and sunflower seeds and a leader in the production of beans, honey, lentils, oats, peas, and sugar beets. Few white settlers came to the North Dakota region before the 1870's because railroads had not yet entered the area. During the early 1870's, the Northern Pacific Railroad began to push across the Dakota Territory. Large-scale farming also began during the 1870's. Eastern corporations and some families established huge wheat farms covering large areas of land in the Red River Valley. The farms made such enormous profits they were called bonanza farms. White settlers, attracted by the success of the bonanza farms, flocked to North Dakota, rapidly increasing the territory's population. In 1870, North Dakota had 2,405 people. By 1890, the population had grown to 190,983. North Dakota was named for the Sioux people who once lived in the territory. The Sioux called themselves Dakota or Lakota, meaning allies or friends. One of North Dakota's nicknames is the Peace Garden State. This nickname honors the International Peace Garden, which lies on the state's border with Manitoba, Canada. North Dakota is also called the Flickertail State because of the many flickertail ground squirrels that live in the central part of the state. North Dakota is in the U.S. region known as the Great Plains. The state shares the Red River of the North with Minnesota to the east. South Dakota is to the south, Montana is to the west, and the Canadian provinces of Saskatchewan and Manitoba are to the north. North Dakota is near the middle of North America with a stone marker in Rugby, North Dakota marking the "Geographic Center of the North American Continent". With an area of 70,762 square miles (183,273 km2), North Dakota is the 19th largest state. The western half of the state consists of the hilly Great Plains as well as the northern part of the Badlands, which are to the west of the Missouri River. The state's high point, White Butte at 3,506 feet (1,069 m), and Theodore Roosevelt National Park are in the Badlands. The region is abundant in fossil fuels including natural gas, crude oil and lignite coal. The Missouri River forms Lake Sakakawea, the third largest artificial lake in the United States, behind the Garrison Dam. Eastern North Dakota is overall flat; however, there are significant hills and buttes in western North Dakota. Most of the state is covered in grassland; crops cover most of eastern North Dakota but become increasingly sparse in the center and farther west. Natural trees in North Dakota are found usually where there is good drainage, such as the ravines and valley near the Pembina Gorge and Killdeer Mountains, the Turtle Mountains, the hills around Devil's Lake, in the dunes area of McHenry County in central North Dakota, and along the Sheyenne Valley slopes and the Sheyenne delta. This diverse terrain supports nearly 2,000 species of plants. North Dakota has a continental climate with hot summers and cold winters. The temperature differences are significant because of its far inland position and being in the center of the Northern Hemisphere, with roughly equal distances to the North Pole and the Equator. As such, summers are almost subtropical, but winters are cold enough to ensure plant hardiness is very low. Native American peoples lived in what is now North Dakota for thousands of years before the coming of Europeans. The known tribes included the Mandan people (from around the 11th century), while the first Hidatsa group arrived a few hundred years later. They both assembled in villages on tributaries to Missouri River in what would become the west-central North Dakota. Crow Indians traveled the plains from the west to visit and trade with the related Hidatsas after the split between them - probably in the 17th century. Later came divisions of the Dakota people - the Lakota, the Santee and the Yanktonai. The Assiniboine and the Plains Cree undertook southward journeys to the village Indians, either for trade or for war. The Shoshone Indians in present-day Wyoming and Montana may have carried out attacks on Indian enemies as far east as the Missouri. A group of Cheyennes lived in a village of earth lodges at the lower Sheyenne River (Biesterfeldt Site) for decades in the 18th century. Due to attacks by Crees, Assiniboines and Chippewas armed with fire weapons, they left the area around 1780 and crossed Missouri some time after. A band of the few Sotaio Indians lived east of Missouri River and met the uprooted Cheyennes before the end of the century. They soon followed the Cheyennes across Missouri and lived among them south of Cannonball River. Eventually, the Cheyenne and the Sutaio became one tribe and turned into mounted buffalo hunters with ranges mainly outside North Dakota. Before the middle of the 19th century, the Arikara entered the future state from the south and joined the Mandan and Hidatsa. With time, a number of Indians entered into treaties with the United States. Many of the treaties defined the territory of a specific tribe (see the map). From 1762 to 1802, the region formed part of Spanish Louisiana. European Americans settled in Dakota Territory only sparsely until the late 19th century, when railroads opened up the region. With the advantage of grants of land, they vigorously marketed their properties, extolling the region as ideal for agriculture. Congress passed an omnibus bill for statehood for North Dakota, South Dakota, Montana, and Washington, titled the Enabling Act of 1889, on February 22, 1889 during the administration of President Grover Cleveland. His successor, Benjamin Harrison, signed the proclamations formally admitting North Dakota and South Dakota to the Union on November 3, 1889. The rivalry between the two new states presented a dilemma of which was to be admitted first. Harrison directed Secretary of State James G. Blaine to shuffle the papers and obscure from him which he was signing first. The actual order went unrecorded, thus no one knows which of the Dakotas was admitted first. However, since North Dakota alphabetically appears before South Dakota, its proclamation was published first in the Statutes At Large. In recent years, the state has had lower rates of unemployment than the national average, and increased job and population growth. Much of the growth has been based on development of the Bakken oil fields in the western part of the state. Estimates as to the remaining amount of oil vary, with some estimating over 100 years worth of oil remaining in the area. For decades, North Dakota's annual murder rate and the violent crime rate was regularly the lowest in the United States. In recent years, however, while still below the national average, crime has risen sharply. In 2016, the violent crime rate was three times higher than in 2004 with the rise mostly occurring in the late 2000s, coinciding with the oil boom era. This happened at a time when the overall US violent crime rate declined slightly. Workers in the oil boom towns have been blamed for much of the increase. The United States Census Bureau estimates North Dakota's population was 760,077 on July 1, 2018, a 13.01% increase since the 2010 United States Census. This makes North Dakota the U.S. state with the largest percentage in population growth since 2011. The fourth least-populous state in the country, only Alaska, Vermont, and Wyoming have fewer residents. 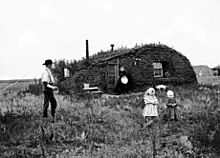 Throughout the latter half of the nineteenth century and into the early twentieth century, North Dakota, along with most of the midwest, experienced a mass influx of newcomers from both the eastern United States and immigrants from Europe. North Dakota was a known popular destination for immigrant farmers and general laborers and their families, mostly from Norway, Sweden, Germany and the United Kingdom. Much of this settlement gravitated throughout the western side of the Red River Valley, as was similarly seen in South Dakota and in a parallel manner in Minnesota. This area is well known for its fertile lands. By the outbreak of the First World War, this was among North America's richest farming regions. But a period of higher rainfall ended, and many migrants weren't successful in the arid conditions. Many family plots were too small to farm successfully. Since the late 20th century, one of the major causes of migration from North Dakota is the lack of skilled jobs for college graduates. Expansion of economic development programs has been urged to create skilled and high-tech jobs, but the effectiveness of such programs has been open to debate. During the first decade of the 21st century, the population increased in large part because of jobs in the oil industry related to development of tight oil (shale oil) fields. 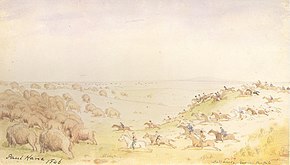 Paul Kane witnessed and participated in the annual bison hunt of the Métis in June 1846 on the prairies in Dakota. The primary historic tribal nations in or around North Dakota, are the Lakota and the Dakota ("The Great Sioux Nation" or "Oceti Sakowin," meaning the seven council fires), the Blackfoot, the Cheyenne, the Chippewa (known as Ojibwe in Canada), and the Mandan. The federally recognized tribes have Indian reservations in the state. Social gatherings are known as "powwows" (or wacipis in Lakota/Dakota) continue to be an important part of Native American culture and are held regularly throughout the state. Throughout Native American history, powwows were held, usually in the spring, to rejoice at the beginning of new life and the end of the winter cold. These events brought Native American tribes together for singing and dancing and allowed them to meet with old friends and acquaintances, as well as to make new ones. Many powwows also held religious significance for some tribes. Today, powwows are still a part of the Native American culture and are attended by Natives and non-Natives alike. In North Dakota, the United Tribes International Powwow held each September in the capital of Bismarck, is one of the largest powwows in the United States. A pow wow is an occasion for parades and Native American dancers in regalia, with many dancing styles presented. It is traditional for male dancers to wear regalia decorated with beads, quills, and eagle feathers; male grass dancers wear colorful fringe regalia, and male fancy dancers wear brightly colored feathers. Female dancers dance much more subtly than the male dancers. Fancy female dancers wear cloth, beaded moccasins, and jewelry, while the jingle dress dancer wears a dress made of metal cones. Inter-tribal dances during the powwow, allow everyone (even spectators) can take part in the dancing. Around 1870 many European immigrants from Norway settled in North Dakota's northeastern corner, especially near the Red River. Icelanders also arrived from Canada. Pembina was a town of many Norwegians when it was founded; they worked on family farms. 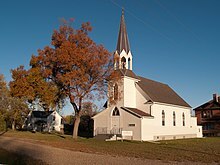 They started Lutheran churches and schools, greatly outnumbering other denominations in the area. This group has unique foods such as lefse and lutefisk. The continent's largest Scandinavian event, Norsk Høstfest, is celebrated each September in Minot's North Dakota State Fair Center, a local attraction featuring art, architecture, and cultural artifacts from all five Scandinavian countries. The Icelandic State Park in Pembina County and an annual Icelandic festival reflect immigrants from that country, who are also descended from Scandinavians. Old World folk customs have persisted for decades in North Dakota, with the revival of techniques in weaving, silver crafting, and wood carving. Traditional turf-roof houses are displayed in parks; this style originated in Iceland. A stave church is a landmark in Minot. Ethnic Norwegians constitute nearly one-third or 32.3% of Minot's total population and 30.8% of North Dakota's total population. Ethnic Germans who had settled in Russia for several generations grew dissatisfied in the nineteenth century because of economic problems and because of the revocation of religious freedoms for Mennonites and Hutterites. By 1900, about 100,000 immigrated to the U.S., settling primarily in North Dakota, South Dakota, Kansas, and Nebraska. The south-central part of North Dakota became known as "the German-Russian triangle". By 1910, about 60,000 ethnic Germans from Russia lived in Central North Dakota. They were Lutherans and Roman Catholics who had kept many German customs of the time when their ancestors immigrated to Russia. They were committed to agriculture. Traditional iron cemetery grave markers are a famous art form practiced by ethnic Germans. Ed Schultz was known around the country until his death in July 2018 as the host progressive talk radio show, The Ed Schultz Show, and The Ed Show on MSNBC. Shadoe Stevens hosted American Top 40 from 1988 to 1995. Josh Duhamel is an Emmy Award-winning actor known for his roles in All My Children and Las Vegas. Nicole Linkletter and CariDee English were winning contestants of Cycles 5 and 7, respectively, of America's Next Top Model. Kellan Lutz has appeared in movies such as Stick It, Accepted, Prom Night, and Twilight. Bismarck was home of the Dakota Wizards of the NBA Development League, and currently hosts the Bismarck Bucks of the Champions Indoor Football. Fargo is home to the USHL Ice Hockey team the Fargo Force. Agriculture is North Dakota's largest industry, although petroleum, food processing, and technology are also major industries. Its growth rate is about 4.1%. According to the Bureau of Economic Analysis the economy of North Dakota had a gross domestic product of $55.180 billion in the second quarter of 2018. The per capita income was $34,256,when measured from 2013-2017 by the United States Department of Commerce. The three-year median household income from 2013–2017 was $61,285. As of December 2018[update], the state's unemployment rate is among the lowest in the nation at 2.7%. It has not reached 5 percent since 1987. At end of 2010, the state per capita income was ranked 17th in the nation, the biggest increase of any state in a decade from rank 38th. The reduction in the unemployment rate and growth in per capita income is attributable to the oil boom in the state. Due to a combination of oil-related development and investing in technology and service industries, North Dakota has had a budget surplus every year since the 2008 market crash. Since 1976, the highest that North Dakota's unemployment rate has reached is just 6.2%, recorded in 1983. Every U.S. state except neighboring South Dakota has had a higher unemployment rate during that period. The state is the largest producer in the U.S. of many cereal grains, including barley (36% of U.S. crop), durum wheat (58%), hard red spring wheat (48%), oats (17%), and combined wheat of all types (15%). It is the second leading producer of buckwheat (20%). As of 2007[update], corn became the state's largest crop produced, although it is only 2% of total U.S. production. The Corn Belt extends to North Dakota, but is more on the edge of the region instead of in its center. Corn yields are high in the southeast part of the state and smaller in other parts of the state. Most of the cereal grains are grown for livestock feed. 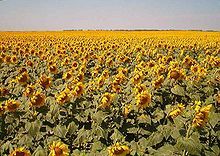 The state is the leading producer of many oilseeds, including 92% of the U.S. canola crop, 94% of flax seed, 53% of sunflower seeds, 18% of safflower seeds, and 62% of mustard seed. Canola is suited to the cold winters and it matures fast. Processing of canola for oil production produces canola meal as a by-product. The by-product is a high-protein animal feed. Interstate 94 in North Dakota, near Gladstone. Transportation in North Dakota is overseen by the North Dakota Department of Transportation. The major Interstate highways are Interstate 29 and Interstate 94, with I-29 and I-94 meeting at Fargo, with I-29 oriented north to south along the eastern edge of the state, and I-94 bisecting the state from east to west between Minnesota and Montana. 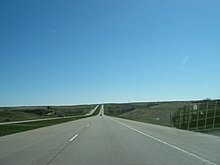 A unique feature of the North Dakota Interstate Highway system is virtually all of it is paved in concrete, rather than blacktop, because of the extreme weather conditions it must endure. BNSF and the Canadian Pacific Railway operate the state's largest rail systems. Many branch lines formerly used by BNSF and Canadian Pacific Railway are now operated by the Dakota, Missouri Valley, and Western Railroad and the Red River Valley and Western Railroad. The executive branch is headed by the elected governor. The current governor is Doug Burgum, a Republican who took office December 15, 2016, after his predecessor, Jack Dalrymple did not seek reelection. The current Lieutenant Governor of North Dakota is Brent Sanford, who is also the President of the Senate. The offices of governor and lieutenant governor have four-year terms, which are next up for election in 2020. The governor has a cabinet consisting of appointed leaders of various state government agencies, called commissioners. The other elected constitutional offices are secretary of state, attorney general, state auditor, and state treasurer. 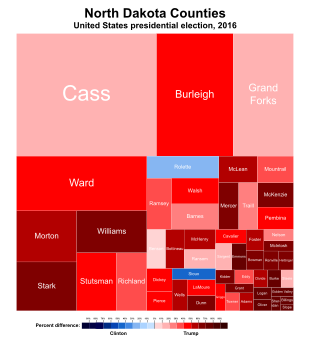 The North Dakota Legislative Assembly is a bicameral body consisting of the Senate and the House of Representatives. The state has 47 districts, each with one senator and two representatives. Both senators and representatives are elected to four-year terms. The state's legal code is named the North Dakota Century Code. North Dakota's United States Senators are John Hoeven (R) and Kevin Cramer (R). The state has one at-large congressional district represented by Representative Kelly Armstrong (R). North Dakota has a slightly progressive income tax structure; the five brackets of state income tax rates are 1.1%, 2.04%, 2.27%, 2.64%, and 2.90% as of 2017. In 2005 North Dakota ranked 22nd highest by per capita state taxes. The sales tax in North Dakota is 5% for most items. The state allows municipalities to institute local sales taxes and special local taxes, such as the 1.75% supplemental sales tax in Grand Forks. Excise taxes are levied on the purchase price or market value of aircraft registered in North Dakota. The state imposes a use tax on items purchased elsewhere but used within North Dakota. Owners of real property in North Dakota pay property tax to their county, municipality, school district, and special taxing districts. 56.54% of North Dakota's 755,393 people live in one the top ten most populated cities. Grand Forks and Devils Lake are in scenic areas of North Dakota. West Fargo, the fifth largest city in North Dakota, is one of the fastest growing cities. and was recognized as a Playful City USA by KaBOOM! in 2011. Williston is near the confluence of the Missouri River and the Yellowstone River near Montana. Medora in the North Dakota Badlands hosts the Medora Musical every summer and is the gateway to Theodore Roosevelt National Park. Fort Yates, along the Missouri River on the Standing Rock Indian Reservation, claims to host the final resting place of Hunkpapa Lakota leader Sitting Bull (Mobridge, South Dakota also claims his gravesite). State nicknames: Roughrider State, Flickertail State, Peace Garden State, Sioux state. State song: "North Dakota Hymn"
"The Flickertail State" is one of North Dakota's nicknames and is derived from Richardson's ground squirrel (Spermophilus richardson ii), a very common animal in the region. The ground squirrel constantly flicks its tail in a distinctive manner. In 1953, legislation to make the ground squirrel the state emblem was voted down in the state legislature. Lynn Anderson, country music singer. David C. Jones, 9th chairman of the U.S. Joint Chiefs of Staff. Roger Maris, right fielder in Major League Baseball and former single season home run record holder. Cara Mund, Miss America 2018. Carson Wentz, professional football player for the Philadelphia Eagles. Connor McGovern, professional football player for the Denver Broncos. Griffin Neal, professional football player for the New Orlean Saints. ^ a b Shactman, Brian (August 28, 2011). "Unemployed? Go to North Dakota". CNBC. Retrieved February 7, 2013. ^ a b Fernando, Vincent; Jin, Betty (August 23, 2010). "10 States With Ridiculously Low Unemployment – And Why". Business Insider. Retrieved February 7, 2013. ^ a b Shaffer, David (December 22, 2012). "N. Dakota population growth is tops in U.S". Star Tribune. Retrieved February 7, 2013. ^ "Facts and figures". infoplease.com. Retrieved June 22, 2006. ^ "Land and Water Area of States, 2000". Information Please. 2006. Retrieved August 17, 2007. ^ "Theodore Roosevelt National Park Virtual Tour". The Real North Dakota Project. 2007. Archived from the original on September 25, 2007. Retrieved August 17, 2007. ^ "History of Lake Sakakawea State Park". North Dakota Parks & Recreation Department. 2003. Archived from the original on September 28, 2007. Retrieved August 17, 2007. ^ "A Glacier, A Lake, A Valley and Soil for the Future". University of Minnesota. 1979. Retrieved August 17, 2007. ^ "North Dakota Facts and Trivia". 50States.com. 2007. Retrieved August 17, 2007. ^ "Flora of North Dakota: Checklist". ashipunov.info. Retrieved September 4, 2017. ^ "North Dakota climate averages". Weatherbase. Retrieved November 10, 2015. ^ a b c Wood, W. Raymond and Thomas D. Thiessen: Early Fur Trade On The Northern Plains. Canadian Traders Among the Mandan and Hidatsa Indians, 1738-1818. Norman and London, 1987, p. 5. ^ Ahler, Stanley A., T. D. Thiessen and M. K. Trimble: People of the Willows. The Prehistory and Early History of the Hidatsa Indians. Grand Forks, 1991., p. 38. ^ Wood, W. Raymond: Notes on the Crow-Hidatsa Schism. Plains Anthropologist, Vol. 22 (1977), pp. 83-100, p. 86. ^ Milloy, John S.: The Plains Cree. Trade, Diplomacy and War, 1790-1870. Winnipeg, 1988, pp. 47-66. ^ Wood, W. Raymond: The Earliest Map of the Mandan Heartland: Notes on the Jarvis and Mackay 1791 Map. Plains Anthropologist. Vol. 55, No. 216 (Nov. 2010), pp. 255-276, p. 266. ^ Hyde, George E.: Life of George Bent. Written From His Letters. Norman, 1987. pp. 9-15. ^ Wood, W. Raymond: The Earliest Map of the Mandan Heartland: Notes on the Jarvis and Mackay 1791 Map. Plains Anthropologist. Vol. 55, No. 216 (Nov. 2010), pp. 255-276, p. 272. ^ , Meyer, Roy W.: The Village Indians of Upper Missouri. The Mandans, Hidatsas, and Arikaras. Lincoln and London, 1977, p. 90. ^ "Audio Transcript of Pierre Gaultier de La Vérendrye 1738". The Atlas of Canada. 2003. Archived from the original on October 13, 2007. Retrieved August 19, 2007. ^ "Louisiana Purchase - History, Facts, & Map". Britannica.com. Retrieved September 4, 2017. ^ "Enabling Act". Washington State Legislature. Archived from the original on September 19, 2007. Retrieved August 19, 2007. ^ "North Dakota's Boundaries". North Dakota Geological Survey. 2002. Retrieved August 19, 2007. ^ "CHAPTER 10-06.1 Corporate or Limited Liability Company Farming" (PDF). State of North Dakota. Retrieved December 29, 2016. ^ Harkinson, Josh (March 27, 2009). "How the Nation's Only State-Owned Bank Became the Envy of Wall Street". Mother Jones. Archived from the original on December 30, 2016. Retrieved December 29, 2016. ^ "North Dakota State Capitol Building & Grounds Virtual Tour Map". The Real North Dakota Project. Archived from the original on September 25, 2007. Retrieved August 19, 2007. ^ "North Dakota Timeline". WorldAtlas.com. Retrieved August 19, 2007. ^ a b "North Dakota History: Overview and Summary". State Historical Society of North Dakota. 1999. Archived from the original on April 3, 2007. Retrieved August 19, 2007. ^ Perry, Mark (January 31, 2013). "Bakken oil boom in North Dakota might last for 100 years". American Enterprise Institute. Retrieved February 7, 2013. ^ Effgen, Christopher. "United States Crime Rates 1960 - 2016". www.disastercenter.com. ^ "Crime In North Dakota's Oil Boom Towns Is So Bad That The FBI Is Stepping In". ^ Effgen, Christopher. "North Dakota Crime Rates 1960 - 2016". www.disastercenter.com. ^ a b "QuickFacts North Dakota; UNITED STATES". 2018 Population Estimates. United States Census Bureau, Population Division. March 14, 2019. Retrieved March 14, 2019. ^ "North Dakota Historical Population". North Dakota State University. Archived from the original on November 13, 2007. Retrieved August 19, 2007. ^ "North Dakota QuickFacts from the US Census Bureau". Archived from the original on June 15, 2006. Retrieved August 19, 2007. ^ "statecenters". U.S. Census Bureau. 2000. Archived from the original on June 22, 2013. Retrieved November 21, 2006. ^ Resident Population Data. "Resident Population Data – 2010 Census". 2010.census.gov. Archived from the original on October 19, 2013. Retrieved December 14, 2011. ^ "Leading Population Trends in North Dakota". North Dakota State University. 2007. Archived from the original on August 18, 2007. Retrieved August 19, 2007. ^ "Agenda 2003 – Saving North Dakota". The Forum of Fargo-Moorhead. 2002. Archived from the original on September 27, 2007. Retrieved August 19, 2007. ^ "Oil boom turbocharges North Dakota population growth", The Denver Post, Retrieved on July 12, 2013. ^ "Where refugees go in America". Washington Post. Retrieved September 4, 2017. ^ "Fiscal Year 2014 Refugee Arrivals - Office of Refugee Resettlement - Administration for Children and Families". Acf.hhs.gov. Retrieved September 4, 2017. ^ "North Dakota leads nation in refugee resettlement per capita". Inforum.com. Retrieved September 4, 2017. ^ "Federal funding issued for refugee resettlement". Inforum.com. Retrieved September 4, 2017. ^ "Cumulative Estimates of the Components of Population Change for the United States, Regions and States: April 1, 2000 to July 1, 2015 (NST-EST2008-04)". U.S. Census Bureau. December 15, 2015. Archived from the original (CSV) on February 5, 2009. Retrieved January 16, 2009. ^ Data Access and Dissemination Systems (DADS). "American FactFinder – Results" Archived August 15, 2014, at the Wayback Machine. ^ 2010 Census Data. "2010 Census Data – 2010 Census". 2010.census.gov. Archived from the original on March 24, 2011. Retrieved December 14, 2011. ^ "Historical Census Statistics on Population Totals By Race, 1790 to 1990, and By Hispanic Origin, 1970 to 1990, For The United States, Regions, Divisions, and States". Census.gov. Archived from the original on December 24, 2014. Retrieved April 18, 2014. ^ "Census Viewer". Censusviewer.com. January 8, 2014. Archived from the original on January 8, 2014. Retrieved September 4, 2017. ^ 2010 Census Data. "2010 Census Data". Census.gov. Retrieved April 18, 2014. ^ a b c "American Religious Identification Survey". Exhibit 15. The Graduate Center, City University of New York. Archived from the original on September 13, 2006. Retrieved November 24, 2006. ^ "Presbytery of the Northern Plains". Presbytery of the Northern Plains. Retrieved September 4, 2017. ^ "North Dakota – Religions". City-data.com. Retrieved September 13, 2013. ^ "The Association of Religion Data Archives | State Membership Report". Thearda.com. Retrieved November 27, 2013. ^ "Most Spoken Language in North Dakota in 2010". Modern Language Association. Archived from the original on June 19, 2006. Retrieved December 15, 2013. ^ "US Census 2000" (PDF). Retrieved September 13, 2013. ^ "Germans from Russia Heritage Collection". Library.ndsu.edu. September 1, 2002. Retrieved September 13, 2013. ^ "Josh Duhamel". IMDb. 2007. Retrieved August 19, 2007. ^ "Fish Species". North Dakota Game and Fish Department. 2007. Archived from the original on October 13, 2007. Retrieved August 19, 2007. ^ "Economy of North Dakota". NetState. June 4, 2007. Retrieved October 4, 2007. ^ "Gross Domestic Product by State, 2nd quarter 2018". Bureau of Economic Analysis. January 19, 2019. Retrieved February 9, 2019. ^ "Current-Dollar Gross Domestic Product (GDP) by State and Region, 2017:Q1-2018:Q2" (PDF). U.S. Bureau of Economic Analysis. January 19, 2019. Retrieved February 9, 2019. ^ "Per capita income in past 12 months (in 2017 dollars), 2013-2017". United States Department of Commerce. Retrieved February 9, 2019. ^ O'Neal, Adam (February 12, 2014). "N. Dakota Again Tops Job-Creation List, D.C. Second". Real Clear Politics. Retrieved February 12, 2014. ^ Thomas, G. Scott (June 27, 2013). "Governors and jobs: How governors rank for job creation in their states". The Business Journals. Retrieved February 12, 2014. ^ Saad, Lydia (February 12, 2014). "North Dakota Leads in Job Creation for Fifth Straight Year". Gallup. Retrieved February 12, 2014. ^ Nowatzki, Mike (March 25, 2014). "N.D. leads nation in personal income growth again". Prairie Business. Archived from the original on April 19, 2014. Retrieved March 26, 2014. ^ "ND records nation's highest personal income growth". Yahoo News. March 25, 2014. Retrieved March 26, 2014. ^ Graeber, Daniel (March 26, 2014). "Economy in oil-rich North Dakota booming". UPI. Retrieved March 26, 2014. ^ "Will $60 Oil Ruin North Dakota's Economy?". 247wallst.com. Retrieved September 4, 2017. ^ "Amazon to Expand Customer Service Center in Grand Forks, ND". Bloomberg L.P. Retrieved December 21, 2012. ^ Gunderson, Dan. "With Microsoft, Hitachi to open software business in Fargo". Minnesota Public Radio. Retrieved December 21, 2012. ^ "Local Area Unemployment Statistics Home Page". Bls.gov. Retrieved February 18, 2019. ^ Cauchon, Dennis (March 17, 2011). "North Dakota economy booms, population soars". USA Today. ^ Canova, Timothy. "The Public Option: The Case for Parallel Public Banking Institutions" (PDF). Archived from the original (PDF) on March 10, 2013. Retrieved January 31, 2013. ^ "Current Unemployment Rates for States and Historical Highs/Lows". Bls.gov. January 18, 2019. Retrieved February 18, 2019. ^ "North Dakota — DP-3. Profile of Selected Economic Characteristics: 2000". U.S. Census Bureau. Retrieved August 30, 2007. ^ "Extension". Csrees.usda.gov. April 19, 2011. Retrieved October 23, 2012. ^ a b c d United States Department of Agriculture (December 2009). 2007 Census of Agriculture. 1. Part 51. pp. 276–293, pp. 345–355, p. 434, pp. 474–489. ^ "NASS – Publications – Trends in U.S. Agriculture". Nass.usda.gov. December 5, 2005. Archived from the original on August 15, 2012. Retrieved October 23, 2012. ^ "North Dakota's Top Agricultural Commodities" (PDF). Archived from the original (PDF) on December 14, 2013. Retrieved September 27, 2013. ^ "EIA Renewable Energy-North Dakota Renewable Profile". May 27, 2008. Archived from the original on May 27, 2008. ^ "Coal Statistics". National Mining Association. May 15, 2011. Archived from the original on May 15, 2011. Retrieved November 15, 2018. ^ "Things To Do In North Dakota". ThingsToDo.com. Retrieved October 4, 2007. ^ Gunderson, Dan (August 28, 2006). "North Dakota oil patch is booming". Minnesota Public Radio. Retrieved October 4, 2007. ^ Donovan, Lauren (June 20, 2006). "North Dakota may be bigger oil player than Alaska". Bismarck Tribune. ^ "3 to 4.3 Billion Barrels of Technically Recoverable Oil Assessed in North Dakota and Montana's Bakken Formation—25 Times More Than 1995 Estimate". U.S. Geological Survey. April 10, 2008. Retrieved April 11, 2008. ^ "North Dakota Drilling and Production Statistics". Dmr.nd.gov. Retrieved September 4, 2017. ^ "Crude Oil Production". Eia.doe.gov. Retrieved September 4, 2017. ^ "North Dakota becomes US's 2nd-leading oil producer - Economic Times". July 10, 2012. Archived from the original on July 10, 2012. Retrieved September 4, 2017 – via Archive.is. ^ "Earth Policy Reader". Archived from the original on June 4, 2009. Retrieved February 25, 2009. ^ Lukas, Paul (November 1, 1999). "State Secret North Dakota, our least visited state, is also among the most underappreciated". CNNMoney.com. Retrieved July 13, 2010. ^ Meltzer, Matt (September 20, 2015). "The Least-Visited States in America, and Why You Should Go to Each". Thrillist.com. Retrieved September 4, 2017. ^ "First Annual Centennial Strategy for Theodore Roosevelt National Park" (PDF). August 2007. Retrieved July 13, 2010. ^ "Norsk Høstfest". October 7, 2006. Archived from the original on March 25, 2010. ^ Elvins, Sarah (September 2, 2015). "'A river of money flowing south': cross-border shopping in North Dakota and the insatiable Canadian desire for American goods, 1900–2001". History of Retailing and Consumption. 1 (3): 230–245. doi:10.1080/2373518X.2015.1134256. ISSN 2373-518X. ^ Verified Trauma Centers. American College of Surgeons. Retrieved April 10, 2014. ^ Health Resources. Ndhealth.gov. Retrieved on May 22, 2014. ^ "Licensed and Non-Licensed Affiliates". BCBSND. Retrieved April 18, 2014. ^ "North Dakota Department of Human Services". Nd.gov. Retrieved April 18, 2014. ^ "Health Insurance Marketplace for Individuals". HealthCare.gov. March 31, 2014. Retrieved April 18, 2014. ^ Blair, Whitney (December 6, 2010). "Why Walgreens In Fargo, N.D., Can't Fill Your Prescriptions". Npr.org. Retrieved April 18, 2014. ^ "Secretary of State - Election Night Results - November 8th, 2016". results.sos.nd.gov. Retrieved September 4, 2017. ^ "ND Department of Emergency Services : Welcome". Nd.gov. Retrieved September 4, 2017. ^ "ND Department of Emergency Services : About NDDES". Nd.gov. Retrieved September 4, 2017. ^ "Home - GeoComm". GeoComm. Retrieved September 4, 2017. ^ "Map Data Development Services -". Geo-comm.com. Retrieved September 4, 2017. ^ "Emergency Services Communications Systems" (PDF) (North Dakota Century Code). Retrieved June 7, 2017. ^ "Dakota, Missouri Valley and Western Railroad". Dakota, Missouri Valley and Western Railroad. Retrieved October 5, 2007. ^ "About Us". Red River Valley and Western Railroad. Archived from the original on October 13, 2007. Retrieved October 5, 2007. ^ "Amtrak — Routes — Northwest". Amtrak. Archived from the original on October 11, 2007. Retrieved October 5, 2007. ^ Transit / Data Maps Archived December 12, 2013, at the Wayback Machine. NDSU SURTC. Retrieved on July 12, 2013. ^ "State Government". State of North Dakota. Retrieved October 6, 2007. 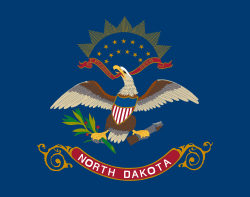 ^ "North Dakota Administrative Code | North Dakota Legislative Branch". Legis.nd.gov. July 1, 1978. Retrieved April 18, 2014. ^ "District Courts". North Dakota Supreme Court. Retrieved October 6, 2007. ^ "All District Judges". North Dakota Supreme Court. Retrieved October 6, 2007. ^ "North Dakota Judicial System". North Dakota Supreme Court. Retrieved October 6, 2007. ^ "2017 Tax Tables for Form ND-1" (PDF). Office of State Tax Commissioner, North Dakota. Retrieved July 26, 2018. ^ "States Ranked by Total State Taxes and Per Capita Amount: 2005". U.S. Census Bureau. Archived from the original on April 9, 2007. Retrieved October 4, 2007. ^ "Sales and Use". Office of State Tax Commissioner, Tax Department, North Dakota. Retrieved October 4, 2007. ^ "Grand Forks: Economy — Major Industries and Commercial Activity". City-Data.com. Retrieved October 4, 2007. ^ "Property". Office of State Tax Commissioner, Tax Department, North Dakota. Retrieved October 4, 2007. ^ a b "Tax Research Areas > North Dakota". The Tax Foundation. Retrieved December 14, 2011. ^ Smith, Nick. "North Dakota named best-run state for third year". Bismarcktribune.com. Retrieved September 4, 2017. ^ "City of West Fargo Official Website". Westfargond.gov. Retrieved September 4, 2017. ^ "Official Portal for North Dakota State Government". nd.gov. June 16, 1957. Retrieved December 14, 2011. ^ S. D. Senate Bill No. 134. ^ "First Stations in Each State". National Radio Club. Archived from the original on October 13, 2007. Retrieved October 6, 2007. ^ AM Query Results – Audio Division (FCC) USA. Transition.fcc.gov. Retrieved on July 12, 2013. ^ FM Query Results – Audio Division (FCC) USA. Transition.fcc.gov. Retrieved on July 12, 2013. ^ Radio Online ®. Ratings.radio-online.com (June 8, 2013). Retrieved on July 12, 2013. ^ "North Dakota's First Television Station". Prairie Public. Archived from the original on October 23, 2007. Retrieved October 6, 2007. ^ "Nielsen Media 2011–2012 Local Market Estimates". TVJobs.com. Retrieved January 9, 2013. Eisenberg, C. G. History of the First Dakota-District of the Evangelical-Lutheran Synod of Iowa and the Other States. (1982). 268 pp. the University of North Dakota, Bureau of Governmental Affairs, ed., A Compilation of North Dakota Political Party Platforms, 1884–1978. (1979). 388 pp.